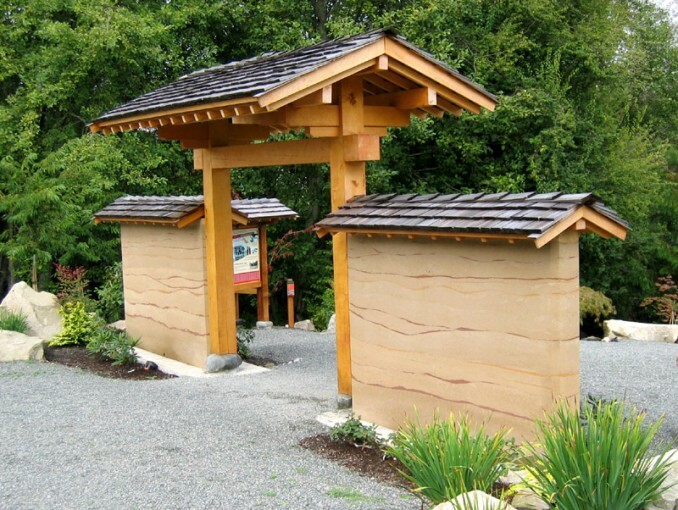 Graced with a layered roof typical of Japanese architecture, Tim was inspired by this gate that welcomes visitors to Hope Park in Ganges on Salt Spring Island, British Columbia. The frame of the roof was built in layers, starting with three beams, then rafters on top of these, and finally purlins to support the T&G sheathing and roof tiles. The overall effect of the layered roof system is simple and dignified. The post bottoms are scribed to stones, keeping water and ground moisture from rotting the posts, and adding an element of natural beauty to the structure.